One of my favorite things to do is try a new restaurant and I am so lucky to live in San Diego where there’s always a new, surprising local restaurant for me to experience. Recently I got to try a great new-to-me restaurant while at Liberty Station in Point Loma called Soda & Swine. This open, mid-century style restaurant was such a surprise in the best possible way. The atmosphere is the perfect mix of fun and sophistication with a corn-hole game outside and a custom-built, glass-topped Foosball table that actually spans the room and accommodates multiple games at once. For starters, Soda & Swine has some amazing cocktail and snack options. We chose to go old school with gin and tonics because they actually carry my favorite California gin from St. George, which I previously posted about here. We also ordered their spiced crispy chickpeas. I could have eaten all of these by myself, but I grudgingly shared. Soda & Swine actually specializes in meat balls and baking (they bake their own bread! ), but they do have vegetarian and vegan meat-less ball options with different and unique sauces! 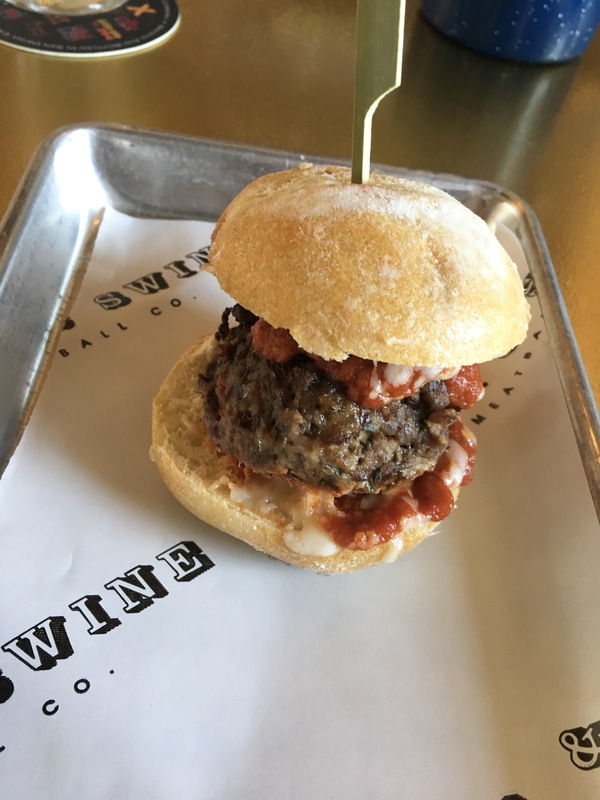 I enjoyed the bovine (beef) slider with traditional marinara and soft fresh bread. My man got a meatball pot pie, which was just as amazing as it sounds with a flaky crust and filled with their mouthwatering pork meatballs! I recommend sitting at the bar if you get the chance to go with just one other person; the bartenders are really great and can give you great suggestions! PS: There’s also a location in North Park!